I know what you’re thinking… “I’ve used Outlook for years, I’m productive enough.” Regardless of how long you’ve used a product (even Outlook), there’s usually something new to learn, particularly in the world of Office 365 and the Office suite. The focus of this blog post is on 8 productivity tips in Outlook to help you be more productive in your day-to-day inbox work. This is a joint post with a friend and co-worker of mine, Ali Fadavinia. Ali and I work together on a large team rolling out Office 365 capabilities, including Outlook (and many other features! ), to an organization. Ali’s technical background is Network and Computer Software Engineering. He enjoys working with cutting-edge technologies and implementing them across infrastructures and organizations. He works with the Office 365 suite of products and tools in his daily work environment. You can reach out to Ali via LinkedIn. Here are the 8 tips Ali wants to share today. There’s a downloadable 1-page PDF of these tips at the end of this post if you want to share with your own organization! Thanks Ali! In your Inbox, click on Unread Mail. It sorts all unread emails to the top of your inbox. An alternate way is to click on the small down arrow next to “Date” to view the ways you can organize your inbox in the list that’s shown. For example, you can look for emails from your boss by clicking on “From” to sort the list of email messages. With Search Folders in Outlook, you can zoom in on a section of your inbox to manage mail faster. Use Search Folders to view messages that meet certain criteria and group them together in one place. It’s important to know that search folders do not relocate messages nor delete any messages as they are “virtual”. To create a new one, right click on Search Folder and select New Search Folder (ctrl+shift+P). Select the Search Folder that meet your needs or create one from scratch on the “Custom” section. Once created, your Search Folders will appear on your Outlook client left-navigation under the Search Folders heading. A great use-case for a Search Folder is to see all of the mail you’ve flagged for follow up in one place! Sometimes an Outlook mailbox can get very crowded. This command examines every conversation in the inbox for redundant messages. Once found, these redundant messages are deleted so they no longer clutter your inbox. On the left pane, select Inbox, go to the Home ribbon > under “Delete” group > click “Clean Up” button. When you select the “Clean Up Folder” button, all redundant messages will move to the Deleted items Folder (or you can select another folder as destination). This feature helps keep Outlook folders organized, and important information easier to find. It’s a great time and space-saver! By categorizing emails, you can quickly find email messages tagged with a specific category! Click the Search bar to open the Search contextual tab and “Refine” group > click “Categorized”. From there, choose the category you are looking for (or alternatively type in the category in the Search bar). Use categories to define your own personal email organization. When filtering by them, it is much easier to find messages since they will follow your categorization scheme. Once a new important email comes in, you can put it into your desired category or create a new category for future searching. To do this, simply choose your email. Great examples of email categories are: Project Name, Campaign name, Urgency, Product name, Customer name, etc. Remember, these are personal email categories. If you send a categorized email to someone else, they won’t see your category. Have you ever found yourself scrolling through tons of emails trying to find that one important message? Applying filters will help you get to that email you need to access quickly and easily. Criteria can be something like whether it is “Flagged”, “Has Attachments”, or other attributes. Click on the “More” Search Criteria button, to see all the filters that are available. How to get someone’s attention? If you want to get someone’s attention in an email message or a meeting invite, you can type the @ symbol, followed by their name, in the body of the email message or a meeting invite. If you do this, not only will their name be highlighted in the message body or invite details, but Outlook will also automatically add them to the To line of the email or the meeting invite. You will see the @ symbol next to the message in your Inbox. Do you receive a lot of emails? Do you want to see only those messages that mentioned you? Have your ever wished your mail could sort itself? You can process your messages automatically through rules (predefined rules or a new blank rule). Go to “File” > “Manage Rules and Alerts” > select “ New Rule” [ alternatively: Home, under “Move” section > click “Rules”]. This will bring up the Rule Wizard. Any email which fulfills that criteria will be sorted into your chosen folder. 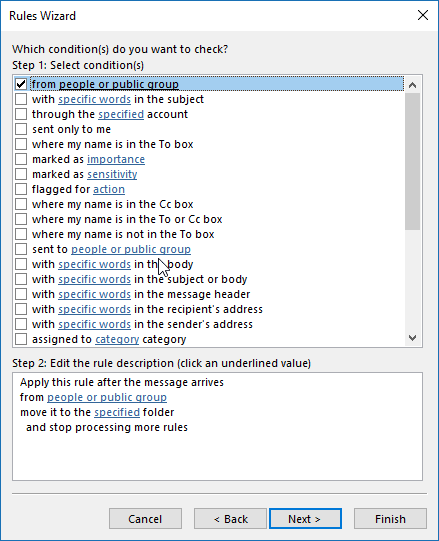 “Send Automatic Replies for emails” containing specific words or coming from specific contacts/public group. If you are often in group messages, and your reply is not necessarily required, you might find it distracting. To differentiate between group and individual messages, you can use conditional formatting to color the message. With this feature, you can force all messages addressed to only you to be formatted in a unique way so they are easy to identify. You can then prioritize these emails as required. Now you can select the desired formatting style and condition for these messages. Once formatted, these email messages will be easily identifiable in your inbox. Thanks for sticking with us! And because you made it this far, we have a special bonus for you! Here’s a handy pdf tip sheet Ali built for these 8 Outlook productivity tips for your own use – Productivity Tip Sheet for Outlook. Although you’re free to download and use the tip sheet, please give credit to Ali for its use! Thanks for reading (and good luck with your inbox)! Previous Post: Does Security & Compliance come at the expense of a Great User Experience? This is a great article. I am just missing one more. There are one more productivity tool in Outlook. That is Office 365 Outlook Add-ins. NOT COM!!!! no, I am talking about Office 365 Add-ins. Let me give you some examples with links. 4 Get a digital personal assistant and never miss a task. MIPA – https://mipa.iglobe.dk/ – assist you to on your planned activities today, this week and next week. These are just few of the Office 365 Add-ins avilable at the Store that will simply make your daily work with Outlook so much easier. I work through these applying one or other of the above quick steps to either archive them without action or mark them for follow up.